Most places I look are focused on single bladed sabers, and the specifics of my dual saber are throwing me for a loop. 1. Design: I am aware of the problems people are having with both saberforge and ultrasabers, but I want a hilt design that both looks good and is functional. Most of them have things protruding off of the hilt which would make it hard to grip while using. So I'm pretty much set with that design from saberforge. 2. One switch: I'm trying to keep the length down so I only want one "switch" with two buttons located in the center. Those are the specifications I want, now this is the part I'm having trouble with. 3. Soundboards/LEDs: First, who has the best value soundboards. They all claim to have the "best on the market" but I've found perks, and problems with each. So basically who gives me the most bang for my buck. Second, I will probably have to buy and install 2 of them. I don't think one soundboard can send separate signals to two different speakers. I will need one soundboard to control the saber activation/deactivation sound for one blade, and all combat noises. While the other just needs to control the activation/deactivation sound of the other saber. I don't want them both blasting combat sounds upon impact, they won't sync up and it will just sound wrong. Hopefully this explains it and any help is appreciated. I like The Custom Saber Shop, if you are looking to make one yourself. The sell Plecter Labs sound cards, which are really nice. They also have forums which can help you out. There are a number of double bladed build threads on there. I can think of a couple of options for clash sounds. One would be to make (or buy) a sound font that didn't have clash sounds, and load that onto one of the boards. Another option would be to tweak the sensitivity settings, so each sound card only registers the clash for the blade on its side. That would probably be the most realistic. Another option is to get two of the single-sabers from a place like Vader's Vault and use a coupler to join them. You could then mute one of the sabers and let the other one do the sound. It's a much more expensive option, though. Have you ever danced with the krayt dragon in the pale moonlight? If you want the shortest double-bladed saber you can get, I would suggest TCSS (if you can catch the parts you want in stock...not always easy). My wife's saber pike is actually a saber body with two emitter/blade holders. The main blade is a standard blade secured with the retention screw and the "shaft" side is an emitter/blade holder with a 10" blade that has the LED and heat sink built into it. Both blades light up with one button (calculate the resistance and stuff needed for two LEDs...not terribly difficult) and the shorter one slides into the handle for the pike when she wants to use it that way. It has room for the button, 4 AAA battery pack, speaker, and the soundboard out of one of those old build a saber kits. Should easily have room if you use a good soundboard and rechargeable battery in a chassis. I think (do not hold me to this as I do not own one) that the Saberforge hilts accept the MWS parts from TCSS. If so, you could, theoretically, use one of their sabers and replace the pommel with a second emitter/blade holder (again, make sure the resistors are right for running two LEDs with the system). I have a couple of the Kyberlight sabers and the coupler. Not bad...but the two hilts will be quite long together, so not sure if that is an option given your wish to keep the hilt as short as possible. 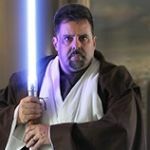 I would echo those that recommended the Custom Saber shop...I've known the owner there for about ten years now, and can safely say he has the best customer service you can find. There is a large selection of parts to choose from, and you can easily come up with a hilt design uniquely your own. As far as the sound boards go, the Plecter Labs boards are the best available, with the NEC boards following. Anything else is just not as good...most have poor sound quality, lack of features, etc.